You don’t have to be a football fanatic to appreciate the Delaware Theatre Company’s production of Playing the Assassin. That’s because Playing the Assassin isn’t really about football — per se. Playing the Assassin by David Robson. Still there’s plenty of up-close body-slamming action in the form of a spirited — and sometimes disturbing — debate about sports ethics, morality, choice, responsibility, family, race and just about anything else the play’s two characters care to toss into one intermission-less act of conversation/altercation. The work by Wilmington-based playwright David Robson premiered last year at Rockland County, New York’s Penguin Repertory Theatre under the direction of Joe Brancato, who reprises those duties here in Delaware as do other members of his team, including actors Ezra Knight and Garrett Lee Hendricks. Knight turns in a gripping performance as Frank, a now-retired football legend whose dirty on-the-field tactics earned him the nickname “The Assassin” and who was responsible for inflicting a devastating in-game injury on an opposing player, rendering him paralyzed from the neck down. The action takes place in a modern yet not-quite-five-star hotel suite in downtown Chicago. Frank has been flown in by a segment producer from CBS Sports for a much-hyped pre-Super Bowl sit-down with the player he injured years ago. Playing the Assassin is the product of Robson’s musings about what might have taken place if the two players had met and attempted a reconciliation. Hendricks plays Lewis, the suited-up, buttoned-down, eager-to-please (if somewhat green) producer charged with convincing Frank to sign a contract for the no-holds-barred interview which is to include an apology. Lewis seems a bit too interested in the details of the accident, the reason for which comes through later in the play. What follows is a cat-and-mouse game between the vainglorious Frank and the persistent Lewis, culminating in a demonstration of Frank’s tackling prowess which turns shockingly violent. Frank grows increasingly suspicious of Lewis, accusing him of lying about the other party’s willingness to participate in the interview. In the midst of it all, we learn that Frank has written his memoirs which make no mention of the tragic incident that captured international media attention. Both actors manage worthy and durable performances as their characters evolve through a series of striking revelations and twists of fate that at times seem strained and contrived. Knight is a standout in the meatier of the two roles. He deftly combines the swagger of his past glory with the stark reality of his diminished physicality and a deep-seated guilt and anger over an incident that has shadowed him and tainted his legacy. 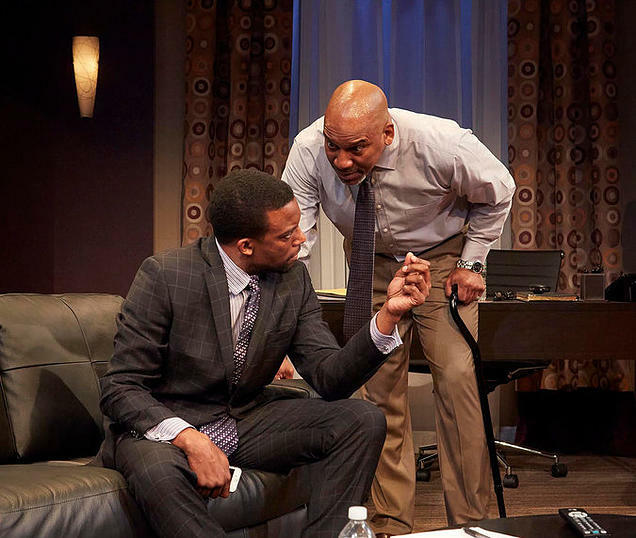 Hicks initially presents Lewis an affable production assistant but gradually blends in a hostility that presages a deep-seated resentment and belligerence. Robson does not directly address some of the weightier issues facing football today, namely, fan complicity in the glorification of gridiron violence and the league’s failure to prepare players — especially injured players — for life after the big leagues. But then, Robson didn’t set out to write a play about football. Just a story about two men who at the sound of the two-minute warning need to make a play for redemption before the clock runs out. Playing The Assassin runs at Delaware Theatre Company through November 8. 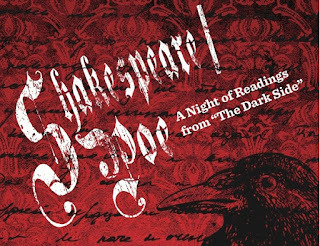 Delaware Shakespeare Festival’s annual “Shakespeare/Poe, Readings from the Dark Side” began its two-week run on October 16. The fourth annual event has expanded the series’ reach with a 10-show run, with each of the three distinct, historic locations –Rockwood Mansion (Wilmington), Read House (New Castle) and the Stone Stable (Odessa) – set for a limited capacity of 30. I have attended past readings at Rockwood, and can attest that the Victorian setting creates a perfect mood for the gothic-themed selections, and no doubt the colonial settings do the same. The selections for the hour-long reading included some works familiar to returning patrons, but the theme was newly expanded to include gothic literary royalty: Ann Radcliffe and Mary Shelley. The handful of readings that repeated from 2014 were, in my opinion, critical to the series theme. It just wouldn’t be a Poe reading without the melodic (and short) Annabel Lee and it wouldn’t be Halloween season without The Raven and the Wyrd Sisters from Macbeth making an appearance. I was shocked to learn my companion had never heard Poe’s haunting love poem, but not surprised that it made an impact. The readings from new authors were well received. The Invisible Girl gave me the kind of willies one gets from a supernatural story, whereas The Mysteries of Udolpho recalled the kind of terror Julia Roberts’ character experienced in Sleeping with the Enemy. Invisible in this case carries both a literal and metaphoric meaning that will be familiar to feminist sympathizers. 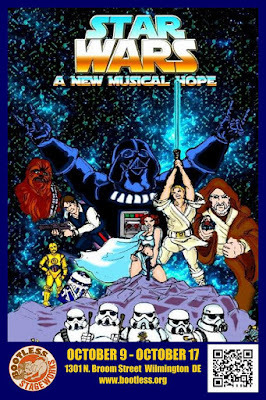 The cast consisted of James Kassees, Danielle Lenee, Matthew Mastronardi, and Megan Slater, with Mastronardi accompanying on the cello. Mastronardi’s arrangements and original compositions, including sound effects, were only applied to a handful of the readings, but to terrific effect, particularly Poe’s The Pit and The Pendulum (my favorite Poe story, which, admittedly, I failed to read in favor of the Vincent Price movie version). David Stradley (who directed the production and assembled the readings) cleverly breaks up the longer readings using the four diverse voices, and the individual cast members effectively project multiple characters in rapid succession when called for. The guest experience was enhanced with the offering of a hot, mulled cider. I was pleased to have a chance to stretch my legs, despite there being no intermission, thanks to a quiz-off between another patron and me; we took turns listening to a line of text and guessing whether it was Shakespeare or Poe. My 14-year-old son has attended readings before, but this was my husband’s first reading. The pace is quick, and it would be a great entrée into theater for most newbie patrons. As far as children, the content is no scarier than Scar or Ursula or Jafaar, and regularly exposing a young mind to the linguistics of centuries past may make high school Shakespeare assignments easier. I strongly encourage you to buy a ticket for the mini-goth, zombie lover or emo baby in your life – the Hamlet/Raven Mash-up should be right up their alley. Other than a generally excellent setting, there are no lighting effects, which could be interesting in future years. The nearby parking was full, ostensibly due to activity in an adjacent building, but there is a convenient drop off point for passengers, and handicap spaces were still available nearby. DelShakes puts on similar events around Valentine’s Day, with a “Shakespeare + St. Valentine” program planned for 2016. I’m glad the format fits with other holidays. Otherwise, I’d be awaiting the fifth annual Halloween-time reading like a kid anticipating, well, Halloween. Some tickets remain available for late October dates. Click here to order. The Delaware Historical Society’s Center for African American Heritage announces its October Voices of the Elders program, highlighting the life and career of Mayor George C. Wright, Jr. Throughout 2015, the Voices of the Elders series has documented and shared the stories of a prominent African American leaders in Delaware through short films and mini-exhibitions. Past elders featured in this series have included Esthelda Parker Selby, Dr. Joseph E. Johnson, Canon Lloyd Casson and the late James H. Gilliam, Sr. The series will conclude on December 10, 2015. George C. Wright, Jr. has a long history of service in the State of Delaware. He became the first African American to be elected mayor when he became the Mayor of Smyrna in 1982. Mayor Wright held the office of Mayor until 1995 when he decided not to run for another term. Before becoming mayor, he served on the Smyrna Town Council for six terms, beginning in 1969. Mayor Wright also acted as the executive director of the Delaware League of Local Governments and was the chief of staffing for civilian personnel at the Dover Air Force Base from 1956-1989. On Thursday, October 22, there will be a reception beginning at 5:30pm, followed by a film screening and program at 6:30pm. The event will be held in the Copeland Room of the Delaware History Museum, at 504 N. Market Street in downtown Wilmington. Free parking is provided by Colonial Parking in the 6th and Shipley Street lot. Reservations are required and can be made by calling (302) 655-7161 or emailing deinfo@dehistory.org. This program is a collaboration between the Delaware Historical Society’s Center for African American Heritage, WITN22, and the Wilmington City Council. Labels: Delaware Historical Society’s Center for African American Heritage, George C. Wright, Jr.
Information provided here courtesy of Wilmington Renaissance Corporation. 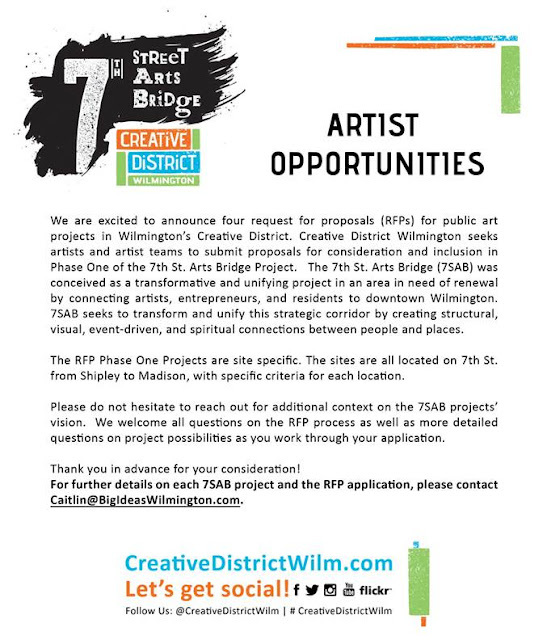 For more detail, email Caitlin@BigIdeasWilmington.com. Celebrating 30 Years of Renaissance Music with Its "Pied Pipers"
Piffaro, The Renaissance Band. Photo by Sharon Torello. 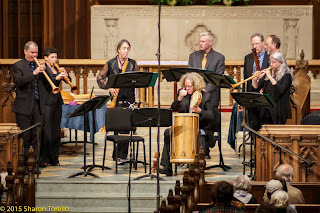 Devotees of Renaissance music packed the chapel at Christ Church in Greenville Sunday to celebrate the opening of Piffaro’s 30th Anniversary Season, welcome back old friends and memorialize the passing of another. Repertoire spanned 15th Century motets by the Low Countries’ Heinrich Isaac to a chaconne by 17th Century Spaniard Juan Aranes. Other composers featured on the program were Ludwig Senfl, Thomas Weelkes, Nicolas Gombert, Jakob Arcadelt as well as the ubiquitous Anonymous. The Renaissance set the stage for much of what lay ahead in Western music. Increasingly freed from medieval constraints, music became a vehicle for personal expression and composers found ways to make their music expressive of the texts they were setting. “La Guerra” by Mateo Flecha is a striking example. Here life’s struggles cast in terms of war and victory are conveyed through constantly changing meters, textures and tonality, all of which were executed to perfection. Throughout the Renaissance, dance music flowered and thrived and was composed — or more likely improvised — by many people. The Suite of Dances by Tylman Susato is a fine representative of some of the outstanding dance music of the late Renaissance. Piffaro’s joyous playing had toes tapping and heads bobbing to the infectious rhythms, making for a fitting close to the two-hour program. There were more subdued moments as well, such as harpist Christa Patton and lutist Grant Herreid duetted on the poignant La Rossignol, an Elizabethan piece originally written for two guitars. 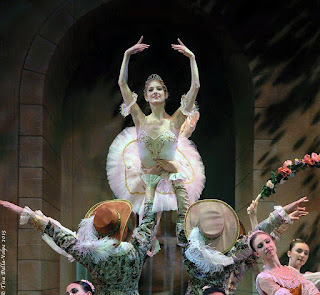 Patton recalled that the piece was used in the 1970s PBS special on Elizabeth I during the scene when the monarch and her fiancé were to meet in secret in a church to exchange vows but somehow missed each other. A touch of sadness pervaded the concert as the ensemble remembered their late colleague Tom Zajac who passed away on August 31. The recorders captured the meditative quality of Nicolas Gombert’s Musae jovis to profound effect, balancing shades of mourning with moments of light and serenity. Gombert wrote the majestic requiem as a lament on the death of his teacher, polyphonic master Josquin des Prez. The concert was also a reunion of sorts, as former ensemble members Adam and Rotem Gilbert (1989-2007), Eric Anderson (1989-1995) and George Hoyt (1996-1999) returned to join the milestone celebration. Delaware & American Craft Week Kicks Off Tomorrow! Celebrating artisans and art organizations throughout the state of Delaware who enrich and contribute to the economic fabric and vibrancy of Delaware. 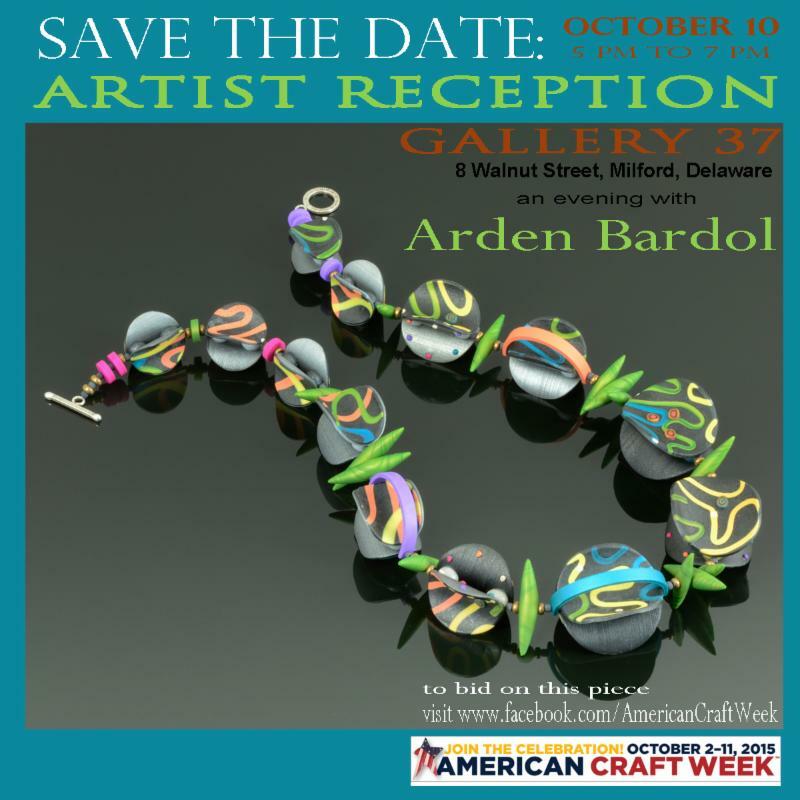 In this month of celebrating arts and humanities, Delaware is prepped to welcome American Craft Week! What began as a small, grassroots effort to enhance the knowledge and appreciation of handmade craft now celebrates its fifth anniversary. American Craft Week is a well-established, national event celebrating the tradition of American craft in artists' studios, galleries, museums, schools, and festivals. In celebration of craft in America, American Craft Week will present a Masterpiece exhibit and sale -- an online exhibition featuring one-of-a-kind work by one exceptional craft artists from each of the 50 states and Washington, DC. An architect who creates wearable art, Arden Bardol of Dover will represent Delaware in this nationwide event. The exhibition will be available online now through October 11. Delaware's 2015 Individual Artist Fellow in Craft, James Ulry, will have an exhibit at the Dover Art League during October, and events will be held throughout Delaware in celebration of American and Delaware Craft Weeks. Listen here to the WILM "State of the Arts" Podcast interview with Esther Lovlie, Lorin Felter and Hilary LaMotte Burke about Delaware Craft Week, all of whom were instrumental in getting Delaware Craft Week into the public's consciousness. Join the Delaware Craft Week Facebook page and support local artists!